We Bet You Didn’t Know This About Bangladesh – Its 10 Must See Places! The longest natural unbroken beach in the world, coral islands, biggest Theravada Buddhist Temple, 12 indigenous communities exclusive to the country, historical Krishna Temple in a riverine nation nurtured by 700 rivers that flow through it including the Ganga, Brahmaputra, Baleshwar, Bhairab, Mathamanga and much more. They have shaped the colorful culture and landscape of Bangladesh, a country we only know for its ‘poverty’ narrative. We will not blame you for mixing this up for some exotic South American rainforest imagery. After all, not many may have experienced and lived the raw and overwhelming beauty of Chittagong in Bangladesh. And yet, it is only the tip of the lake(if not the iceberg), because Bangladesh is a hedonic delight for those seeking history, romance, food or cultural vibrancy. Here is our list of 10 must-visit places in Bangladesh! Rangamati Hill Tract in Chittagong district, surrounded by Indian states of Tripura and Mizoram from the north, Bandarban city and Mizoram from the south, and Myanmar from the east, is one of Bangladesh’s most delightful places and also your go-to if you are seeking to connect with the splendor of nature and its people. The flora and fauna in Rangamati will fill your soul up. But there is also something for those with anthropological interests – Rangamati specifically and Chittagong largely is home to Bangladesh’s dozen indigenous communities, the major ones being the Marmas and Chakmas. Marmas, essentially Theravada Buddhists, have their own Arakanese dialect. Most others have assumed and internalized the cultural and religious traditions of the rest of country. Some of the other indigenous communities here are Tippera, Mru, Chaks, Kumis, Kuki/Lushais, Khyang, Pankho among others. In Rangamati, you can witness the colorful lifestyle and indigenous cultures and you can also take home a piece of this in the form of souvenirs, clothes, show pieces, and jewelry. Thanks to the gift of being located right by the Bay of Bengal, Bangladesh offers many small island destinations for those who love sand and water, like Nijhum Dwip, Moheshkhali, Sonadia Island, and Dublar Char Island. Hanging Bridge (Jhulonto Bridge in Bengali) is an architectural landmark in Rangamati built over Kaptai Lake, offering a splendid view of the lake and the surrounding foliage. From Kaptai Lake you can cover other tourist spots like Shuvalong waterfalls, DC Bungalow and Peda Ting Ting (literally meaning- Eating Full Stomach). Peda Ting Ting is a small secluded island in Kaptai Lake, where tourists can eat amidst green and serene surroundings. Plenty of government and private boat cruises are available to cover these locations. 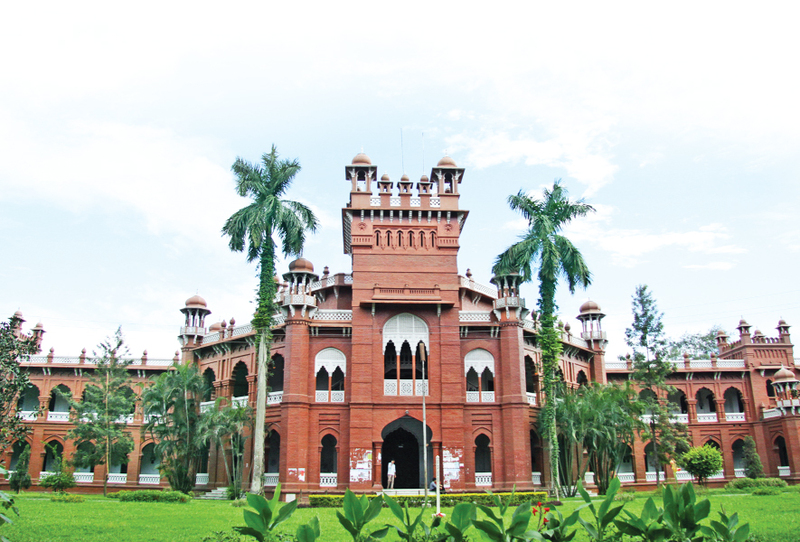 Curzon Hall (Dhaka University) is a place to visit for those who love political history. Curzon Hall became the epicenter for Bengali Language Movement in Bangladesh between 1948 and 1956. After the Partition of India and Pakistan (of which Bangladesh was a part until 1971 Liberation War) Urdu and English were chosen as the state language in Pakistan by its Constituent Assembly. But Bengali was the majority language in erstwhile East Pakistan (Now Bangladesh) and it received a step-motherly treatment. It was at Curzon Hall in Dhaka University that the first noises of protest against linguicism arose from. Kuakata translates to Dug Well in Bengali. The semiotic meaning traditionally goes back to the Rakhine tribe which was ousted from Myanmar, who came to these shores in the 18th century. The settlers dug wells to find drinking water since the salty water from the sea was undrinkable. Since then the name for this 30km long shiny, white sand beach has stayed. It is also known as Sagor Konna or Daughter of The Sea. Gongamati Forest Reserves on the east side of the beach is a thick mangrove forest and you can catch the sun rays getting filtered through the foliage. The beaches offer hypnotizing sights of the sunsets and sunrise as the sea changes color with the lights of the sky. Cox Bazar named after Captain Hiram Cox, an officer serving in East India Company who defeated the Burmese king ruling the region in the 18th century, is the longest natural unbroken beach in the world (120 km long). It is one of the most popular and visually rich tourist destinations in the country with the forest-covered hills on the majority of the stretch, shimmering waves, presence of aquatic life (jellyfish, starfish, oysters, and lobsters among other forms of life), colorful local communities and delicious seafood. After watching the sun rise and set at some of the quietest corners on this golden beach, sunbathing, biking, boating, and bathing in the sea, you can check out the ‘Bazar’ for typical souvenir items like decorative items made from conch-shell, handmade cigars, hand woven cotton clothes, handicrafts made my members of Rakhine tribe. Nakshi Katha, intricately embroidered quilts made typically in West Bengal and Bangladesh is a must buy. You can also find ShitolPati or mats made out of cane skin, made using material that keeps the floor cool. Beautiful doll art made in some of the poorest yet culturally rich nations in the world is another piece of charm to carry back home. Crystal clear blue waters, maddening variety of sea food, landscape dotted with coconut groves, Bangladesh’s only coral island, St. Martin’s Island defines ‘Small is beautiful’. You can take a bus from Dhaka to Teknaf. The journey is over 10 hours long. From Teknaf, you can take a 2-2.5 hour’s long cruise to St Martin’s Island. The cruise over river Naf itself has a touristy feel to it, with the Teknaf hills on one side and Myanmar on the other. Ferries leave the island around 3 pm. Bangladesh has something to offer for every kind of traveler. For those who love history and religion, there is Kantaji (another name for Lord Krishna) Temple in Kantanagar, in Dinajpur. A fine late-medieval Hindu temple, it is a surviving specimen of terracotta architecture built by King Ramnath in 1722 CE. It was built in the Navratna style, with Ratnas or gems adorning each of the nine corners of the three-layered terrace construction. The temple today stands in some glory in spite of numerous attempts to destroy it. Parts of the temple were said to be destroyed by Maharaj Girijanath in the early 20th century and parts of it were damaged in 1897 by an earthquake. The nation’s patriotic sentiment can be read from how it reflects upon its lost cadre. In the memory of those who sacrificed their lives in Bangladesh’s Liberation War(against Pakistan) in 1971, the simple yet elegantly built national monument of Jatiyo Sriti Shoudho or National Martyrs’ Memorial has been built in Savar, 35 km away from Dhaka, the national capital. Even the design of the monument was a result of a democratic exercise where designs for the memorial were invited from all the citizens in 1978. Syed Mainul Hossain’s design was finally selected to build the national monument. Flanked by an artificial lake, the site also hosts several mass graves. The Buddha Dhatu Jadi- Sworna Mondir, one of the largest Theravada Buddhist Temples is located in the hill town of Balaghatain Bandarban City, Chittagong District. Built in 2000, it is one of the more recent gifts of South East Asian heritage architecture. It preserves some of the oldest Buddhist relics. Members of Marma community who live around the area are followers of the Theravada order of Buddhism that emphasizes on paying great respect to age and the elderly and thereby the wisdom they bring to the younger generation. Located at around 200 feet above sea level, you can have the stunning view of the scenic Chittagong division of Bangladesh from the temple. The temple hides between two of Bangladesh’s highest peaks Tajingdong (4,000 feet) and Keokeradong (4,632 feet) marked by lush greenery and thick forestry. While you are here, the Debota Pukur or Pond of God is a must-see. Chittagong is called the ‘rooftop’ of Bangladesh and is one of the most picturesque regions in the country with its green mountains, waterfalls, and rivers. River Sangu flows through Bandarban city. When you are in Bandarban, you can visit Nilachal(Blue mountains), which is a series of lookout spots and walking areas to gaze into the sun sets, green mountains, valleys, rivers and take pictures. You can also check out gushing waterfalls like Nafakhum, ShoiloPropat, and Amiakhum. Famed for its spellbinding green carpeted mountains and hills, rich biodiversity, Bandarban boasts of the highest peak of Bangladesh- Tahingdong (4632 ft). Bandarban is home to 170 plant species including 105 types of trees, 31 kinds of shrubs, 29 herbs and 13 climber species and aquatic flora and fauna. Locals have started making efforts to preserve the biodiversity in this region. For history junkies, Bandarban is also the original home of Mogh tribe and its chief Bomang ruler. This place preserves the tribal cultural life through its folk dance and music.